During this festive season, we’re always looking for spectacular ways to entertain our guests. Any time you want to introduce an element of luxury into an affair, all you have to do is trot out the lobster, and your friends will bless your name. 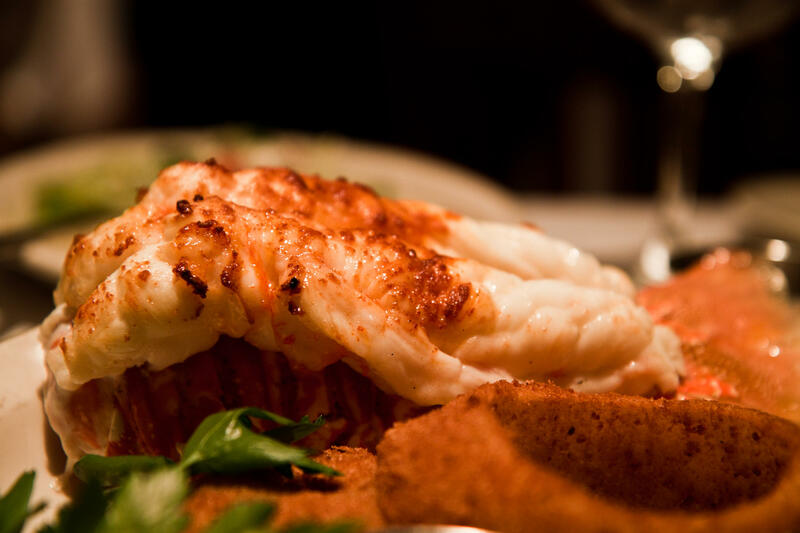 Chef Jerry Pellegrino has discovered you don’t always have to use the entire lobster to get a good dish. A simple lobster tail can do a lot of wonderful things with a lot less waste. The first and simplest technique is to simply broil the tails. This involves cutting them lengthwise along the back of the shell, pulling the halves apart, exposing the meat. Season with butter, salt, white pepper and paprika. Place the tails on a baking sheet and put them under a pre-heated broiler, about 6 inches away from the heat. Allow 5-10 minutes to cook. You’re going for 145° on your meat thermometer. To get a little fancier, you can butterfly the lobster by once again cutting the top of the shell lengthwise, then turn it over and use your thumbs to break the ribs on the bottom side. Gently push the lobster meat out of its shell, leaving it attached at the tail end. Now you can season and sauce your lobster meat and send it off to the broiler. One new idea I learned from Executive Chef Kevin Gresnic of Wegman’s involves puff pastry. The idea is to remove the raw meat from the tail in one chunk, and wrap it with puff pastry in such a way that it resembles the original tail. It’s really very easy, but it makes a fabulous presentation. First, carefully remove the tail meat in one piece and keep it in cold water until you are ready to assemble. Next, thaw out a sheet of puff pastry, and roll it out on a floured surface until it’s about 14” x 14”. Using a straight edge cut long strips of dough about 1 ½” wide, then cut each strip into two shorter strips. Using egg wash as your glue, you are going to build a wrap for the shell on the flat, overlapping or “shingling” the strips. The result bears an uncanny resemblance to the original lobster tail! It will take 4 or 5 strips per tail. Be sure to add a piece to represent the little tail fins. To assemble, take some spinach that you have sautéed, and then squeezed dry, and lay a strip down the middle of the flat “shell”. Then lay the lobster tail belly side up on the spinach. Carefully fold first one side of the dough up and over the lobster meat, then fold the other side up to seal it. I guestimate that you can cut enough strips out of one sheet of puff pastry dough to wrap around 4 tails. Brush a little egg white along the back of the pastry shell to make it glisten. Run a sharp skewer through the length of the lobster tail to keep it from curling up as it cooks, and set the whole thing down on a non-stick cookie sheet. Place in a 350° oven for 40 minutes, until the pastry is golden brown. Serve by pouring a small puddle of sauce in a small dinner plate, place the pastry shell on that, and drizzle a little more sauce on top. Sprigs of dill or fennel ferns will complete the underwater image. One tail per person as an appetizer course.